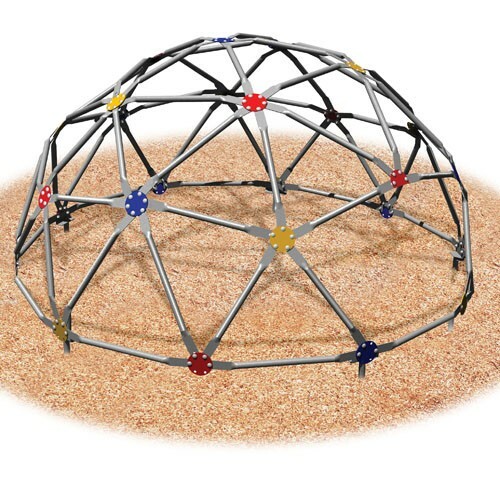 The GeoDome is a great piece of freestanding equipment for any play ground. This commercial play set accessory will encourage growth in imagination and social interaction. The kids will love acting like monkeys by climbing and hanging around on the GeoDome. The GeoDome is a great piece of freestanding equipment for any play ground. This commercial play set accessory will encourage growth in imagination and social interaction. The kids will love acting like monkeys by climbing and hanging around on the GeoDome. The GeoDome is constructed with 1" O.D. galvanized steel pipe, multi-color powder coated connectors, and In-Ground mounts. Safety Surfacing is required for additional safety. Dimensions are 3'6"H x 7'6" diameter.